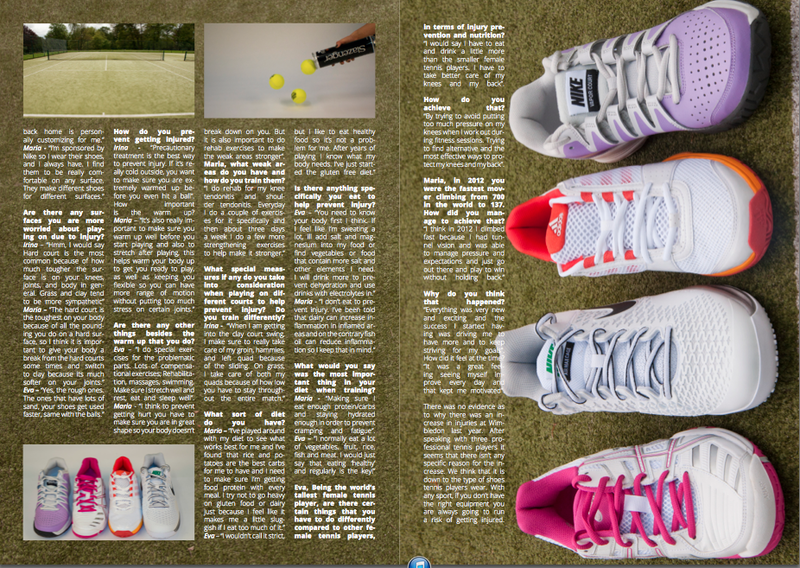 This is my final magazine feature piece,consisting of 3 articles. 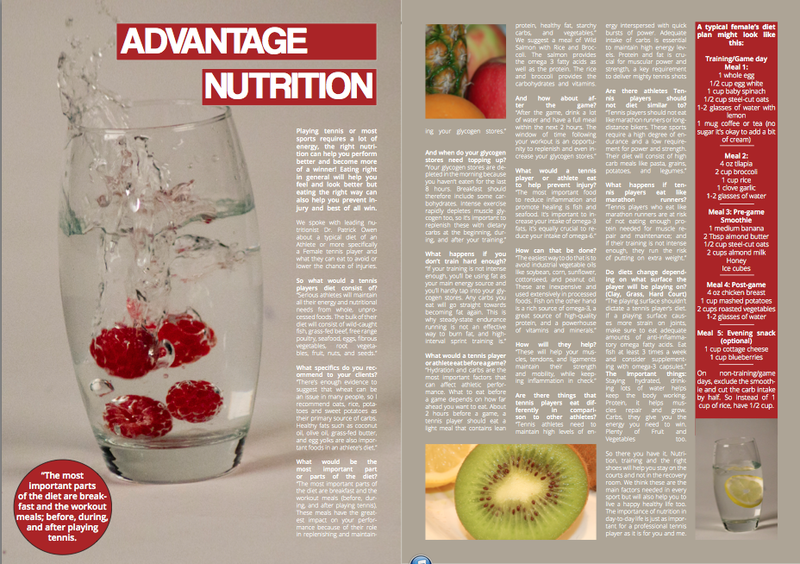 One on Nutrition including an interview with a professional nutritionist. 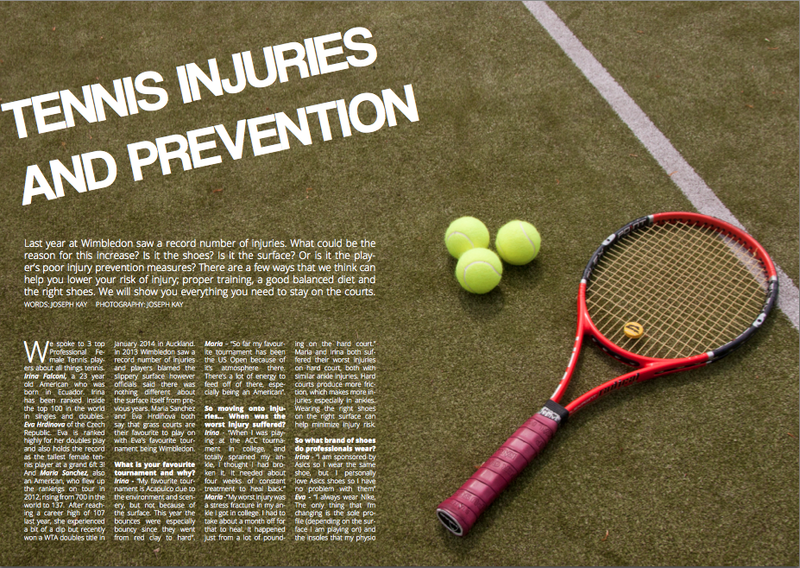 One on tennis injuries including interviews with 3 professional tennis players and a final article based on the best tennis shoes for the right court. I have finally finished this module. I feel that it went successfully and I have learnt a lot from this semester/year. Trying to get products this semester has been a bit of a nightmare.Spent a lot of time and effort trying to get shoes to photograph to fit into my final piece. I rang loads of companies,went into shops and everything but no one was keen to give me shoes. So I had to wait until I got my loan so I could afford to buy shoes to photograph. This obviously resulted in my time plan messing up a lot. I had to wait a lot of time in order to be able to put it all together. I had trouble with the project management as well, because I couldn’t get a product then it meant a lot of things on my project management had to be changed/deleted. Before I could do a lot of things I needed the photographs, this resulted in me going over my plan and doing it later on than I had planned. It all worked out in the end and I managed to get the photographs. Not to solely depend on one thing. I will definitely be having lots of back up plans in the future so that if something goes wrong I have other plans and won’t waste so much time. Got better at public speaking, I felt a lot less worried for my final presentation as I had done for others, I think I was more prepared and more used to doing it. Having never done a presentation before in my life to doing 3 in a semester was quite scary. But by the end one I felt a lot more comfortable. I enjoyed interviewing professional tennis players. I thought it was great to be able to speak to professionals about what they love. It was nice to know that they are just normal people as well and happy to speak to me. 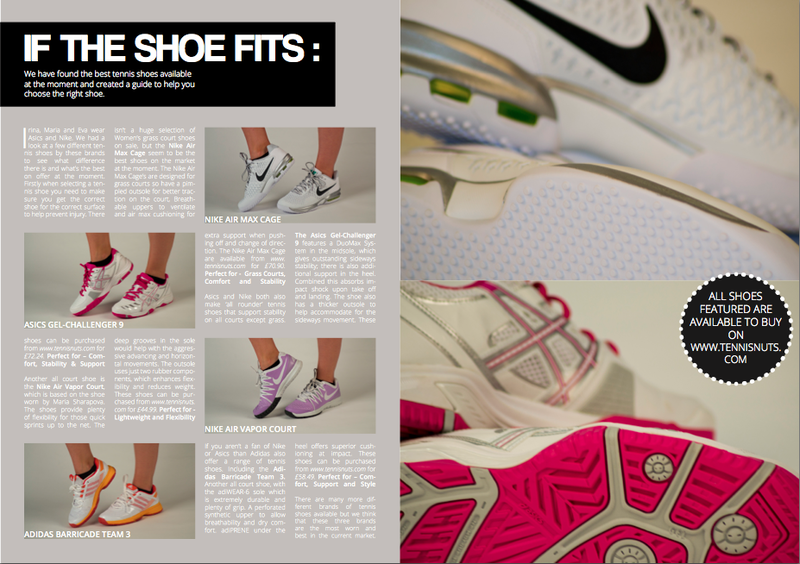 I enjoyed the photography, using the studio to take photographs of the shoes was fun. I used Lucy as my foot model for the photographs. I feel that my photographs came out really well for my final magazine as well. I wouldn’t change my final piece as I think it came out really well. The only thing would possibly be one of my photographs I wasn’t keen on. So would have liked to swapped it,but otherwise I think it looked good. I would have prepared better presentations for my pitch and my work in progress presentation. I was a little confused as to what to put into both of those and so it meant that my presentation didn’t come across very confident. I knew in my head what I was going to do all along but found it hard to explain myself, resulting in it being somewhat of a mystery. I feel like my presentation went relatively well. I think that my actual presentation wasn’t that attractive visually but I feel that I spoke my points across well. I covered all the things that were in our guide, showing demographics,how my work would fit into it etc. I also got my evaluation and project management stuff in for Alison. I spoke well and for the amount of allotted time. I had a question from each lecturer at the end and I felt that I answered them all competently. Sarah asked me, why didn’t I give up on my idea or change my idea when I struggled to find products? I answered by saying that I had all these ideas ages ago about how it would like and most of my work had been aimed at this story so didn’t want to just give up on it because I was finding it hard. A journalist should always stick with the story they’re given and get the story no matter how hard it is! Alison asked me about my Baseline costing compared to Actual costing, I struggled to answer that because I wasn’t 100% sure why it had happened, I think it was because of the amount of tasks I had to cancel because of not having products. Chris’s question was quite a hard one to answer about how I wrote for my specific target market but I answered it well again.And Honey asked me why I used still life photography instead of photographs of people playing tennis. I said this was because of my inspiration from George Ong as he is a still life photographer and also because Women’s health magazine tend to use quite a bit of still life in their work and I wanted to suit my magazine feature piece to them. It was an amazing feeling at the end when it was all done and the nerves had disappeared! I feel like I have got better at presentations but still feel that I could keep improving. One thing I found with my final Gantt was that the statistics were quite strange. The baseline cost was much higher than the actual cost. I really couldn’t figure out how or why this happened. The only thing I could think of was because I had to cancel so many tasks on my Gantt because of the tennis shoes not arriving ages ago. Because of the previous slippage I have had because of not having shoes. I have had to wait until I could afford to buy the products myself to photograph. You can see in my Gantt Chart that this has meant I have overrun on production and have run into what should be the post production stage. It means that I am now doing twice the work to try and compensate and get back on track with my project management. 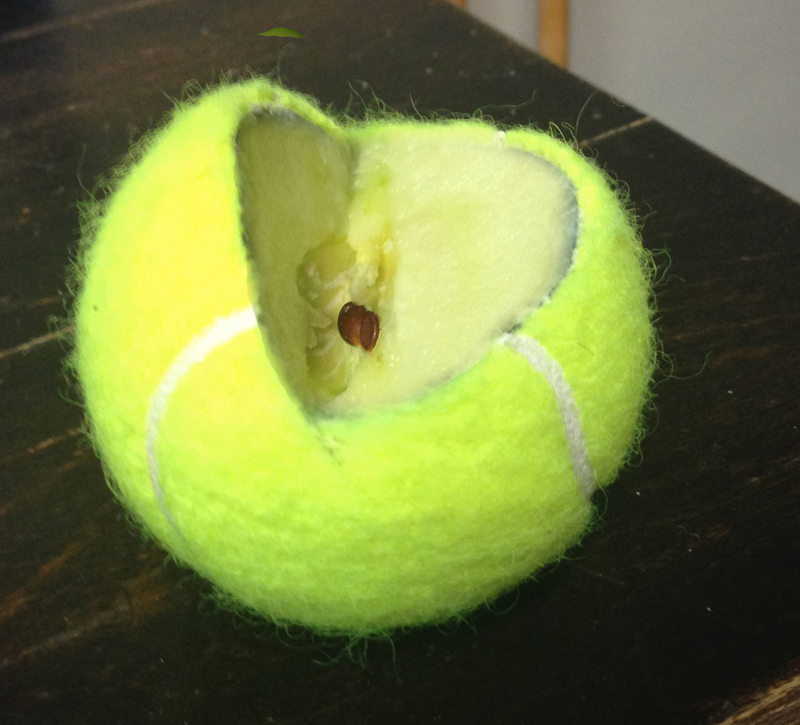 I tried the idea of cutting a tennis ball in half and cutting an apple in half then putting them together in photoshop. The idea sounded like it would be good and look good but it was quite tricky to do and I wasn’t too sure on the overall outcome.